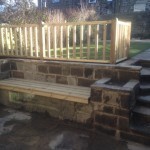 At New Leaf Gardens we can offer a full design and landscape service and bespoke garden projects like this one…Beautiful stone walling with a garden seat created in an old cottage garden. 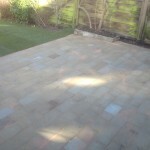 We created a new Yorkshire Stone paved area, a cut above the block paved driveways and not a lot extra in material costs. Very happy with this one!